Due to termination of licensing agreement with Marvel, from April 1, 2017 Playtech casinos do not offer Marvel Hero slots. The same progressive jackpots are now offered on the Age of the Gods series of slots. 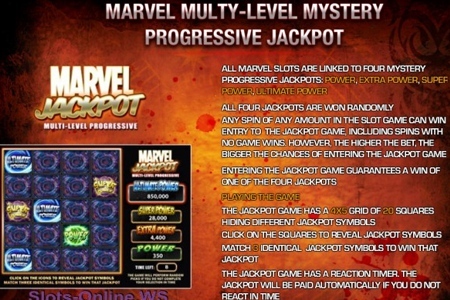 Marvel Mystery is a group of the 4 progressive jackpots that can be won by playing 13 featured slots at Playtech Casinos. 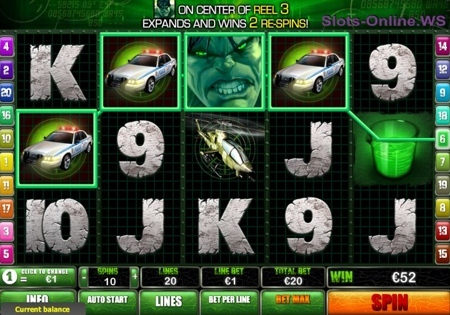 Playtech's Marvel slots were launched in 2009 with Iron Man and the Hulk. In 2010 a range of other Marvel Hero games was added and the Marvel Jackpot Network was launched offering 4 progressives. Slots have from 20 to 50 paylines and various bonus features. Play one of the following Marvel Jackpot games: Blade, Elektra, Daredevil, Ghost Rider, Fantastic Four, The Hulk, Iron Man, Punisher, Thor and X-Men. There are 4 Marvel jackpots in the games: Ultimate, Super, Extra and Power with seeds (min values) of €100,000, €5000, €500 and €50, correspondingly. All jackpots grow progressively as bets are made. Playtech games randomly award you a 'pick a box' feature where you have to match 3 logos to win one of the 4 progressives. Any paid spin with a bet of any size can trigger the Jackpot bonus sidegame. Contribution rate is just 0.99%. Unlike Cryptologic Marvel Hero jackpot slots, Playtech slots offer different, much bigger jackpots that grows much faster! Blade is a 20 payline video slot with Wilds, Scatters, Free Spins with a rotating multiplier and Blade Split bonus. 3 or more scatter Blade Logos anywhere on the reels activate 15 Free Spins with a Multiplier (up to 5x) and an Extra Wild. Top payout - up to 25,000x line bet. Daredevil is a 20 payline video slot machine with wild and scatter symbols, Interactive Bullseye bonus feature and free spins. Hit 3 or more Scatter Daredevil Logos anywhere on the reels to trigger 10 Free Games with Random Wilds. Elektra is a 20 payline video slot with a whole lot of fun with a whole lot of chances to win. Hit 3 or more Scatter Sai Sword symbols anywhere on the reels to activate the Weapons Bonus round with up to 10 free spins where Wild Elektra acts as an Expanding Wild. Fantastic Four is a 5 reel, 20-line slot with Wilds & Scatters, free spins with 4 fantastic bonus features. The Fantastic 4 Logo is wild. 3 or more Scatter Earth symbols anywhere on the screen bring you up to 200x total bet and Free Spin round with 4 Fantastic Features: Mr. Fantastic, the Invisible Woman, the Human Torch, and The Thing. Ghost Rider is a 20 payline video slot with Wild symbol, Scatter symbol and Free Spins bonus features. 3 or more Spider Scatter symbols from left to right trigger the Spider-Man feature. Choose between 15 free spins or the Venom feature. Incredible Hulk (+ Hulk 50 line) is 20 or 50-payline slot with Wilds & Scatters, Smash Bonus feature and Free Spins. The Wild Hulk icon substitutes for all symbols except for Scatter Logo and the Smash Bonus symbol. 3 or more Scatter Logos trigger 10 free spins. The Hulk on reel 3 activate the Expanding Hulk Feature. 2 Smash Bonus symbols on reels 1 & 5 trigger the Smash Bonus round. You pick 3 out of 7 police cars to smash. Iron Man (+ IRM 2 + IRM 2 50 line) is video slot with Wild symbol, Scatter symbol and Free Spin style bonus feature that is now available in 3 modifications: 20 line, 25-line and 50-line games. 3 or more Scatter Iron Man logos activate Free Spin bonus feature with growing multiplier and extra wilds. First Iron Man has 2 Stacked Wilds, Iron Man 2 has the Eagle Medal as the Wild symbol, stacked on free spins. Thor is a 5 reel, 9-payline Progressive slot with Wild & Scatter symbols and Free Spins bonus. The Thor symbol is wild and substitutes for all other symbols except for Hammer Scatter. 3 or more Hammer Scatters anywhere on the reels trigger up to 10 Free Games. X-Men is a 5 reel, 25-payline slot with Wilds and Scatters, Free Spins and X-Feature bonus. 3 or more Scatter X-Men logos anywhere on the reels trigger Free Games features, which is played in 2 Modes: Heroes Mode and Villains Mode. The X-Feature is triggered when any of the hero symbols occupy the 5 locations on the reels 2, 3 and 4.